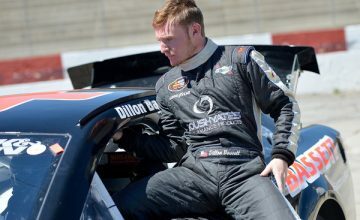 CONCORD, North Carolina — Alex Bowman, next year’s replacement for Dale Earnhardt Jr. earned his first career NASCAR Xfinity Series win Saturday night. Starting third he bested multiple Monster Energy NASCAR Cup Series regulars, including Ryan Blaney, Erik Jones, Austin and Ty Dillon. 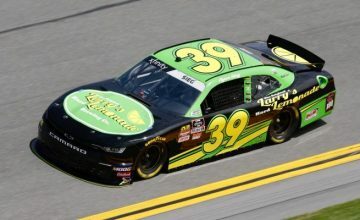 Bowman stayed in contention most of the race by hovering around the top-five but waited until about the three quarter mark to take the lead. Spitting rain covered Charlotte Motor Speedway throughout the afternoon and into the early evening; however, around dinner time the skies stopped wetting the ground and NASCAR could begin drying the track. Just after 8 p.m. the Drive for the Cure 300 got under way. Immediately, the race had the feel of a classic. Two early cautions from a spinning Angela Ruch kept the field bunched during the first stage. Erik Jones, piloting the No. 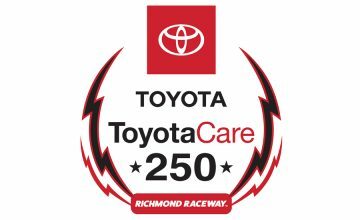 20 Main Street Bistro Toyota for Joe Gibbs Racing haunted his teammate Daniel Suarez for the first 40 laps, but with five to go in the stage Jones nudged his Toyota below his future MENCS teammate. Following the stage break Suarez went around Ty Dillon to retake the race command. He held onto this position for the rest of the stage, but never truly broke away from the front-runners. Jones stayed near the front, Sam Hornish Jr. reminded folks he can still hop in a car and be a wheelman. Late in the third stage Michael Annett went for a spin in turns 3 and four. Though his car stayed on the apron of the track for a period longer than ten seconds no caution was thrown. Photo by Boyd Adams. Suarez won the second stage, Jones and Hornish followed behind and Blaney and Bowman completed the top-five. By this time the points battle for the final spot in the round of eight was getting hot. Ryan Reed, came into the race two points to the good over Brendan Gaughan. All Gaughan was looking to do was finish two spots ahead of Reed – a simple, clear cut objective. Paired together from the beginning these two drivers couldn’t separate themselves from one another. Four cautions flags flew during the final stage. On lap 104 a caution was shown for a stray tire that had found it’s way into the quad-oval grass. Daniel Suarez’s crew lost the tire during a round of pitstops just prior to the yellow flag. He was penalized for the ordeal by way of a pass through penalty and restarting at the tail end of the field. A short while later, on lap 122, Erik Jones spun out. Losing control all by himself in the high lane coming out of turn-two Jones struck the inside backstretch wall. His damage was minimal, using most of the allotted five minutes given to teams for repairs on pit road, the pit crew patched up the No. 20. When the race was restarted Jones made minimum speed and the clock was reset, he could stay in the race. Ryan Reed and Brendan Gaughan battled throughout the entire 300 mile event. Photo by Boyd Adams. Twelve laps after the restart, on lap 142 a debris caution was flown for something no one had ever seen before. The electronic box that tells the flagmen which drivers to black-flag came loose and dropped to the racing surface. It was narrowly missed by a number of cars before the yellow was shown on the speedway. This was an exceptionally dangerous ordeal and no fault of any competitor, but instead, NASCAR officials. The race restarted and Ryan Reed was not doing okay. Screaming over the radio, his car was far too loose for him to maintain or gain track position. He was saved by one last yellow on lap 161 when the no. 52 of Joey Gase layed oil down on the track from the start/finish line down towards turn-one. At this point, Blaney had assumed the lead and was maintaining about a one second gap over second place. Things jumbled up from here. Elliott Sadler restarted the race on point but William Byron had an overtake for the lead a lap later on 167, two more circuits later Bowman hitched his car around his future Hendrick Motorsports teammate. 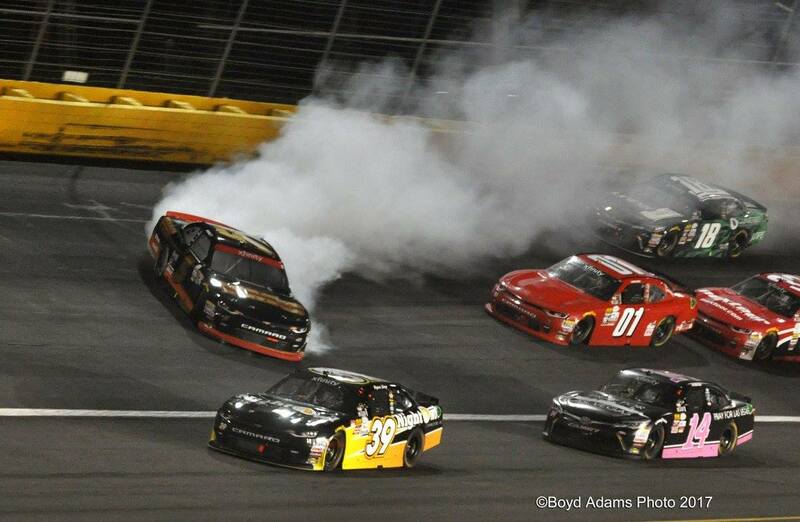 With 31 laps left Bowman found himself leading during his first race of the year. It didn’t. 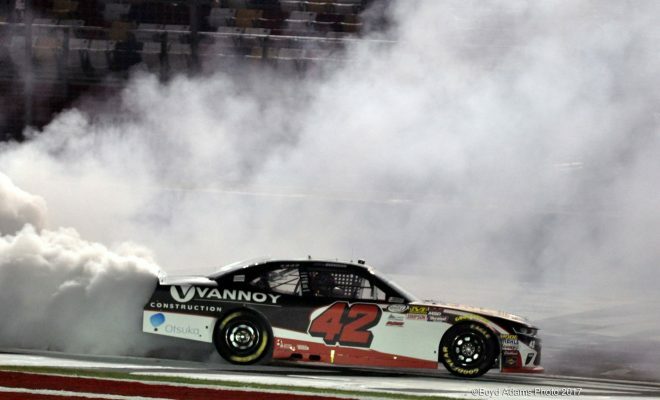 Bowman won his first race, in anything, since 2012. He was 1.39 seconds ahead of second place finisher, Hornish Jr. The race inside the race, between Reed and Gaughan had reached a fevered pitched. For half of the 33 lap final stint Reed did everything in his power to keep the No. 62 car in his rearview. 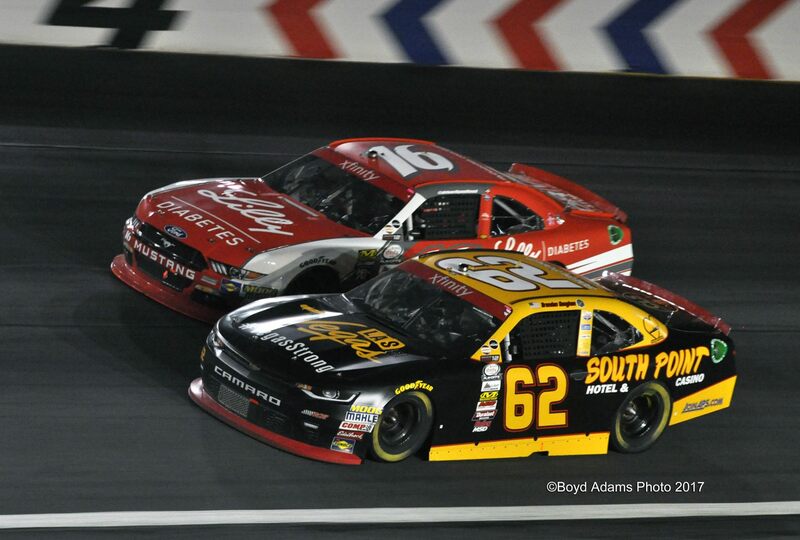 Around fifteen laps Gaughan found a way around the young Roush-Fenway driver. The signature moment of the race came during this battle. As Gaughan went under Reed, Byron was a moving road block. Slower than the pair of duelers, Byron held his car along the outside wall going down the backstretch – with moment from the high line Reed squeezed his way around Byron to keep himself directly behind Gaughan. If Gaughan finished two spots ahead of him he would be out of the playoffs. Gaughan began to gap Reed, in search of getting around Elliott Sadler for that crucial point. Reed spent his time holding off a hard charging foursome. Brandon Jones, Ross Chastain, Austin Dillon, and William Byron were swapping positions and coming for Reed. Brandon Jones made the best go of it, darting under Reed with five to go. His No. 33 Nexteer Automotive Chevrolet wiggled under Reed, he lost momentum and never had a true chance after that. It was the “ten best laps I could put together,” Ryan Reed said after the race.